This post is an effort to give a short summary of City Reach Wichita and to share some of the conclusions we drew from the meeting. I have a feeling the story of City Reach Wichita will be years in the telling and only eternity will reveal it all. I know that evangelists, pastors and even saints have been accused of stretching the limits of believability when it comes to revival reports but I assure you I have made every effort to err on the side of caution in this summation. I promise you, friends, it was that good! I have re-posted some links to pictures and previous posts concerning City Reach Wichita at the bottom of this post. Some how, some way I need to write a summary of what we experienced at City Reach Wichita. I have tried and tried to put this down into words but I can not describe the work that God performed and the marvels that God accomplished during those eight days at the corner of Lincoln and Hydraulic in Wichita, Kansas. It was a highlight of my life and will be for many years to come. Having said that it was a highlight in my life is not the same as saying it was MY work. The souls saved, the families restored, the addicts cleansed, the bodies healed and every other good thing that happened did not come from me. You know that. God knows that and I want you to understand that I know that. One hopeless, broken young man was there six of the eight nights. He hugged my neck weeping and sobbing almost uncontrollably the last two nights saying, "I don't know what I would have done if you had not come and set up this tent. You changed by life. You changed my life. You changed my life." I told him and I will tell you what you already know, If there was anything good done in anyone's life, God is the one that did it. Yes, I was there. Yes, I did my best to preach the Gospel. Yes, I desired to be a help, but churches and saints from across the USA helped me go there, dozens of saints in Wichita worked like mules to make the meeting a success but God orchestrated the whole thing! It was God's intention and purpose to help people just like that hopeless, broken young man! Hallelujah! City Reach Wichita, Kansas ran September 6-13 Sunday through Sunday. Can you say God is faithful, dependable, mindful, powerful to save, powerful to heal, powerful to deliver? Can you say awesome, beautiful, wonderful, incredible and astonishing? That is exactly how I have felt for months and I feel even more overwhelmed now. I have been overwhelmed with the potential, overwhelmed with the responsibilities, overwhelmed with the logistics, overwhelmed with the cost and overwhelmed with the physical requirements. Now I am overwhelmed with the power of God, overwhelmed with the plan of God and overwhelmed with the provision of God. I am overwhelmed with thankfulness and praise that God has visited us and is visiting us in such a mighty, mighty way! God saved, healed and delivered all week long in an astounding way. I know it may seem an exaggeration but if you had been in Wichita, you would be saying to me, “Davy, you left a few things out. Don’t forget to tell about this. Don’t forget to tell about that. What about that lady getting saved? What about that young man that was saved? What about the whole family that came to the altar to be saved? What about the people that were drawn under the tent and were saved even when there was no service being conducted? What about the night when several were in the altar and you said, ‘There are at least a dozen more that need to come to the altar’ and a dozen more responded?” And I really could go on and on and on. It was absolutely amazing to see God’s hand at work in City Reach Wichita! God not only fulfilled my vision of churches working together to win souls in a metropolitan area but magnified that vision and answered the prayers of His saints by putting us in the right location, with the right churches, at the right time, with the right message, to the right people! In other words, City Reach Wichita found all of us smack dab in the middle of a sovereign move of God! One unforeseen aspect of City Reach was the multitudes of people that God drew under the tent even when there was no church service. In large cities we will need to have some one at the tent at all times for various reasons, not the least of which is to discourage theft or vandalism. I knew that in advance. What I did not know was that those people needed to be prepared to listen to folks, talk with folks and pray with folks. 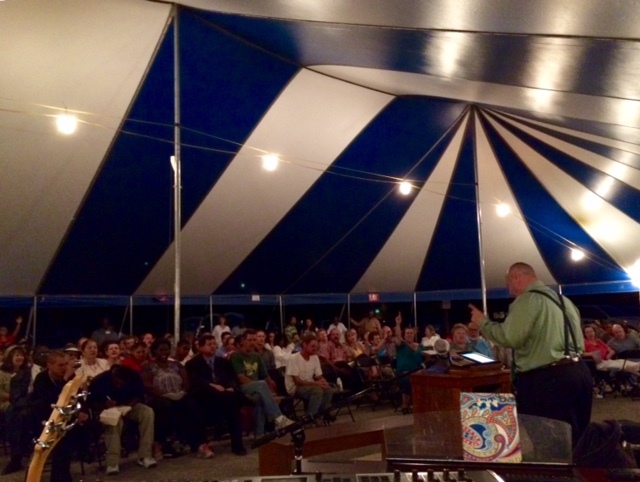 The tent became a literal mission field nearly 24 hours per day. We have had people come to the tent during the day and ask for prayer in other places. We have had a few pray for salvation when they came at other times. But in Wichita, on a busy corner in a neighborhood, the response during the day was tremendous. I do not know how many people were saved at the tent outside of service time but there were several. I personally prayed with several and at least one of them came in so lost and was gloriously saved when all was said and done. That work and that result was repeated several times by several folks that spent time at the tent. Another thing we learned is that whatever the length of City Reach it will almost be long enough. At the end of a 6 night tent revival I have always felt like we were just building momentum and just getting started. Our first City Reach was scheduled for 8 nights and I felt the same way as it came to a close. The Pastors and many of the church folks voiced the same feelings. I need to pray about this. I do have some City Reach campaigns scheduled for 10 days or two weeks. I wonder if we will feel the same way in them or if we will have trouble keeping the interest of the people. One thing we got right was the extreme value of having local churches on the ground that are willing to work. We had four local churches that sponsored the local expenses of the meeting and I can not say how much we appreciate that. There were expenses associated with permits, preparing the property for use, utilities, flyers, bathrooms and many other things. Having local churches to help bear those expenses was incredible. There were two churches that rolled up their sleeves and really went to work to win souls in Wichita. Pastor Don Crowley and the First Church of God in Christ and Pastor John DiZazzo and Bethany Revival Center caught the City Reach vision and worked hard and long to bring it to pass. They put in literally hundreds of hours passing out flyers, knocking on doors, practicing for the combined choir, staffing the tent, greeting visitors, following up on visitor cards and a hundred other things. These local churches on the ground are absolutely necessary. Another thing we were right about was the Andrew Team. We established a team of volunteers to greet people and to be the face of City Reach to folks that came. I envisioned them being like Andrew the disciple, always bringing others to Christ. They were to be examples in worship and also be spiritually sensitive to the needs of visitors under the tent, around the tent and beyond the tent. It was amazing how many people the Andrew Team led to the altar long after the altar service had begun. 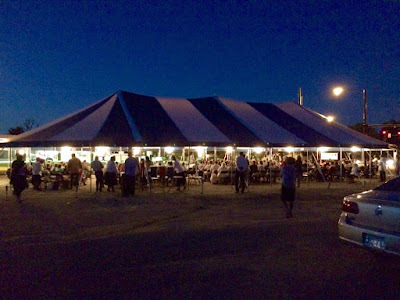 They also prayed with a good number of people at their seats and in the parking lot. I want to duplicate this program in other cities. Pastor DiZazzo told me after the sixth night of City Reach the greeters and the Andrew Team had passed out about 180 first time visitor packets. That is an amazing number and that does not include the last two nights of our biggest crowds. I intend to write about this more, but the Combined Choir singing a song every night was a great idea the worked beautifully. Elder David Bost from First Church of God in Christ organized and directed the choir and God blessed them and us each night. Note to Self: Make sure the Millikin's are in City Reach as much as you can. Having Bro. Jimmy Millikin and his family for three nights of City Reach Wichita was incredible! They are a tremendous blessing. Adding another team member to City Reach was another thing I got right. Bro. Jimmie Radcliffe has been planning to travel with us during City Reach next year and City Reach Wichita was a trial run. Bro. Jimmie is an excellent worker and has a heart to serve. God has used him to minister effectively to the lost and troubled in society and it seems he is especially gifted to reach those that have been hurt and cast aside. Bro. Jimmie is the founder of Salvage Life Restorations, a ministry to men and women that have been damaged by adversity and the misfortunes of life. He reaches for the suffering, the addicts, the homeless, the abused, the used and the grief stricken. For City Reach we have half jokingly but appropriately named him Director of Tent Transportation and Onsite Operations. 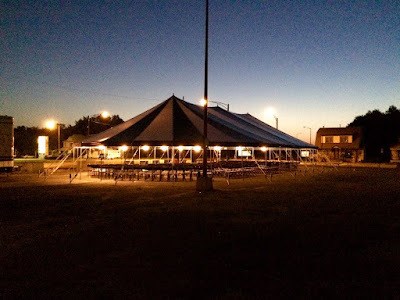 During City Reach Wichita he dealt with all things related to keeping the tent in the air and helping everything run smoothly. But just as I hoped, he was very instrumental in reaching many people for Christ both one on one and in the altar services. We are thrilled to have Bro. Jimmie on board for City Reach and we are looking forward to what God is going to do through him. This is a huge step for us financially and a huge step for Bro. Jimmie as well. It is exciting to see God's hand at work in such a large leap of faith! City Reach Wichita was amazing and to God be all of the glory!!! That should be as plain to see as anything. God deserves the glory for His work. It is also plain for me to see that God used many of you to bring His work to pass. Without the burden of a few select churches and families and individuals City Reach Wichita would have never gotten off the drawing board and onto the street. My dream would be nothing more than a nightmare and maybe even a delusion if not for you and your help. For all of that I want to say thank you from the bottom of my heart. Thank you for your prayers. Thank you for your words of encouragement. Thank you for the offerings you have sent. Thank you for believing in us. We still have more than a year of work ahead of us but now I can see we have more than a year of victories ahead of us as well! Thank you for joining with us on the ride. Thank you for loving souls. Thank you for loving us. May God bless you.